Hi! 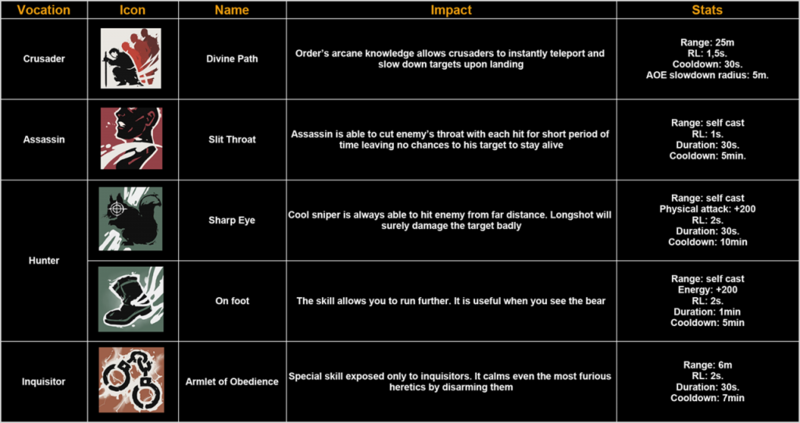 Lots of our players have already checked out update №6 and abilities of different vacations. Today we would like to tell you more about these skills. In the table above you might observe some abbreviations you aren’t familiar with. We would like to help you with knowing what is this for. RL - reload - the time it takes for character to recharge after using weapon/skill/cast in order to use any weapon or magic, again. Cooldown - the time it takes to recharge ability in order to use it again. You can find more terms in our glossary. The update will be available soon - stay tuned! Didn’t have time to know more about Reign of Guilds yet? You can leave request for testing on our forum and we will contact you soon!